You can now buy the S&P 500 index by just turning on MetaMask with the entire process from start to finish over in about 5 minutes or less. Nothing whatever is required from you. No signup, no paperwork, nada. Just some eth and the desire to have ownership of the 500 biggest publicly traded American companies. “USStocks is an ERC20 token representing synthetic ownership of an index of the 500 largest exchange-listed US stocks. 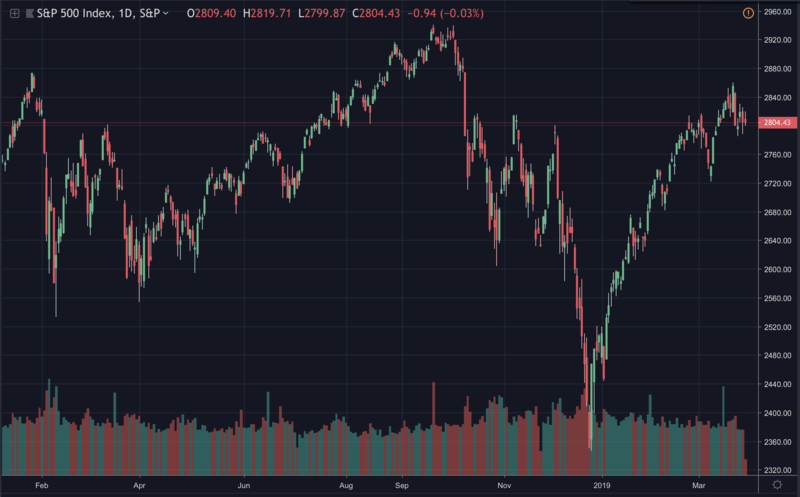 S&P 500 on daily candles, March 2019. To buy this index, we wouldn’t quite know where to begin. The local bank perhaps, or maybe a stock broker. 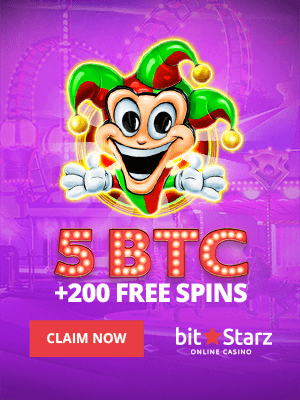 After completing the registration process, waiting for days or weeks for identity verifications to be completed, and after paying perhaps $10 per trade or however much, in addition to complying with minimum investment requirements of perhaps $1,000, you will finally have a promise by the bank or broker that you have this index investment. 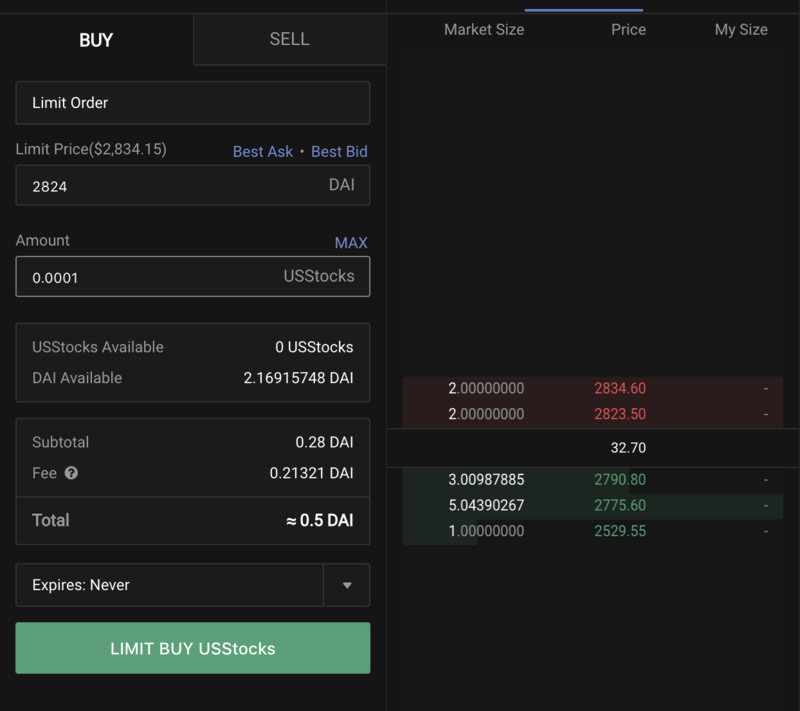 We want this order to be completed as soon as possible, so we enter the limit order above the sell order put out there by others in red. This is a test account, we’re just seeing how it works, so we buy about 50 cent worth of S&P 500 at a slight premium of $20 because not much liquidity here with the fee being just 20 cent. We confirm the order as requested with it finalized in seconds. Trustnodes now proudly has ownership of the American giants. Well, it’s a bit more complicated. We don’t quite have actual ownership of a stock, but then the S&P500 index isn’t quite ownership. It is more of a measure of how America’s biggest companies are performing overall. Even if we’re talking of an actual stock say like Apple, to get an ownership certificate is almost impossible for an ordinary investor. The broker usually has the ownership. You are given a promise based on his/her ownership. Here, no one quite has ownership at all. People are betting say on which horse will win. They don’t own the horse, but if price goes up, one side loses and the other wins. Meaning it’s a derivative, it’s betting on an outcome. It is a bit like options, but this is something new for these pages, although used in traditional markets, and it’s called a Total Return Swap (TRS). In simple terms, you put down in a smart contract lets say 5 eth or units since it can be for anything, and you agree with the other party that this 5 represents 100 units, making that 5 the collateral. If price goes against you, then you’ll lose that 5 very quickly. If it goes in favor, then you could make a lot of money very quickly. Making it basically an option, but without the actual option. In an option, you put down 5 and within a certain time frame you have the right to buy 100 at the price initially agreed, but you don’t have to buy that 100. “Alice initializes an open contract and deposits 10k ETH (currently worth $1mm). Assume Alice, a taker, wants to receive the total return of $10mm of gold for 1 year vs paying a fixed interest rate. Based on the current volatility of gold, Alice decides to set the minimum margin requirements at 5%, and sets a default penalty of 3%. Bob responds saying he will (i) pay the total return to Alice vs receiving 5%, or (ii) he will receive the total return from Alice vs paying 4.75%. [Alice accepts]. 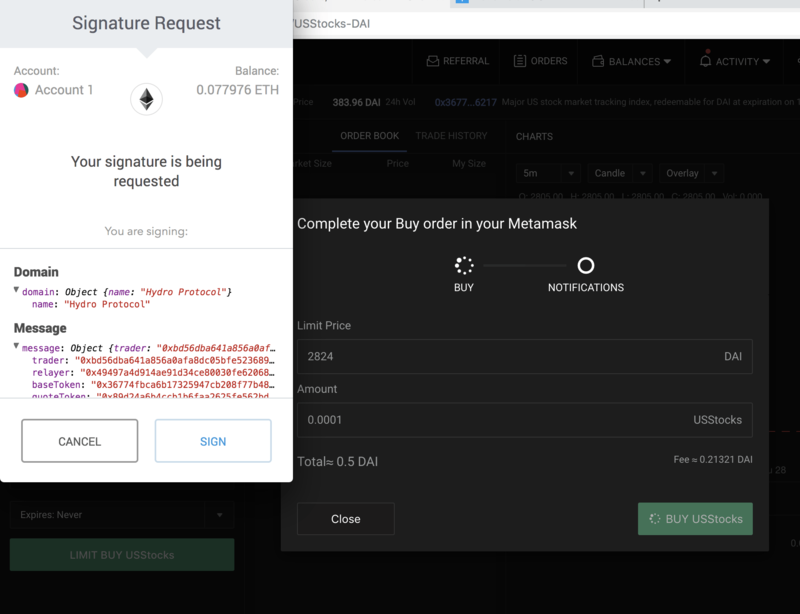 The smart contract informs Bob he is “done” on the trade and transfers the 15,000 ETH Bob already authorized into his margin account within the smart contract. Alice and Bob have now agreed to a contract where their promises to pay each other are backed by ETH margin deposits in the smart contract. -chain, both Alice and Bob monitor and recalculate the [net present value] NPV of the contract and margin requirements. Since gold rallied 9% (from 1,100 to 1,199) and since one day of interest has passed (worth $1,370), both Alice and Bob calculate an NPV of $900,000 – $1,370 = $898,630 in Alice’s favor. Bob knows that if the contract’s remargin() function is called on-chain, the smart contract will move 8,986.30 ETH (worth $898,630) from his margin subaccount to Alice’s margin subaccount. As a result, his margin balance of $1.5mm will be depleted by $898,630 and he will be dangerously close to dropping below the minimum margin requirement (and risk paying the default penalty of $300k). If he doesn’t deposit 10,000 eth, then the contract terminates and he pays a penalty. Meaning there is no counterparty risk here, there is no need for an intermediary, with the smart contract performing those functions and others. Alice can decide just how much she wants the margin to be. Here, 5% for gold might be reasonable, but Bob went way above board and put down far more than required. Had he put down just the $500,000 required, then Alice might have just about been covered by the penalty. We can also see in this example how this differs from options. Who owes who how much is recalculated any time they like. With an option, you can exercise the right to buy if price goes up, or you can just wait until the contract expires if it goes down, with your exposure limited to that 5%. While with TRS, your exposure is in theory unlimited, just as it would be if you are offering an option rather than buying it, but in practice it would be limited to whatever margin level is agreed. So it’s an option basically, but with USstocks, the margin level is at 108%. Meaning the offeror of the stock has to put down not just the entire amount of the current price, but close to 10% more to presumably cover a price rise. Making it a reverse option or a reverse margin or as the whitepaper calls it: Trustless Tokenization. 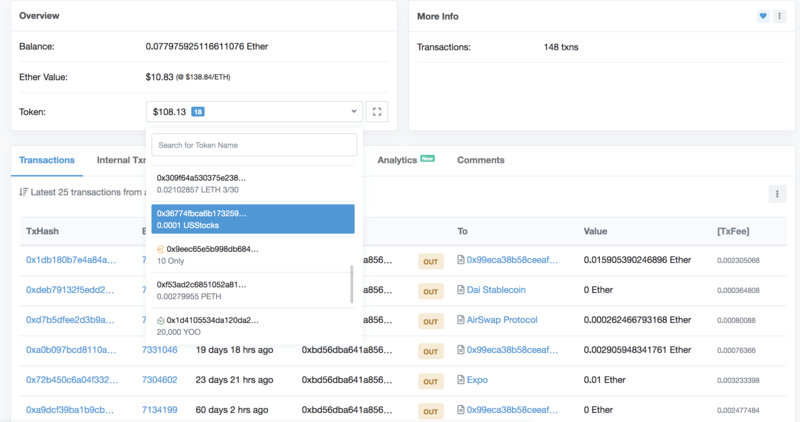 UMA trustless tokenization, March 2019. Applying the above, but in reverse, someone puts down 2,824 dai, plus 10% so lets say 3,000 dai. If S&P’s price goes up, they have to put in more dai to cover the margin, otherwise they get called and presumably pay a penalty. Meaning in effect you’re kind of buying S&P 500. Unlike in the old world, here you can buy 50 cent of it if you want, and you can do so from anywhere in the globe. iv. Synthetic asset systems rely on oracles for price feeds, which begs the question: why should we trust the oracle? Well presumably because if that is abused then they’re killing their business. Once companies tokenize their shares, then you could theoretically get the price directly from some decentralized exchange smart contract in the future, but until then we do still have to deal with the old world. Another downside mentioned here was that “the creation of synthetic assets is illegal in many countries.” Which is why we commend this project for being brave enough to move ahead with innovation regardless of ancient laws. Here there is no trust and whatever trust there is, is agreed between the parties. In free countries at least there is an implicit agreement between law makers or enforcers and the rest that as long as you’re not effectively cheating then the law doesn’t necessarily apply. In technical terms, law enforcers have to ask a very important question: is prosecution in the circumstances in the public interest? That’s another way of saying: did the person cheat, or is the law just outdated or not quite applicable to the circumstances or would you look like a fool and get huge backlash if you went with it? Innovation must not wait the green-light of our very old grandfathers in congress or parliament where they are all consumed with immensely more important matters. Plus, code is actually speech. So it’s about time we washed our lady liberty for here the guilds are being opened and knowledge is flourishing. how are transaction prices determined?